It is like having an extra hand to hold the leash. It makes walking any dog relaxed & easy. Simple To Use: It works with any standard leash. 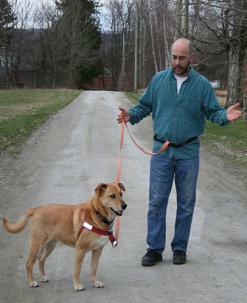 Just slide your leash handle onto the belt, buckle the belt around your hips…and walk! The Zen Part: Tension filled walks are a thing of the past. No more holding the leash with that two-fisted death grip because your dog pulls so hard. Because the leash is also being held by the belt you will be more relaxed…and so will your dog. Dogs pick up on our tension, they feel our stress, and then they become stressed. Jogging/Running: Walking belts are also known as running belts - as you can now jog with your dog, without having to focus on holding the leash. Careful please running with any dog - they don't sweat like we do and can overheat easily. Great For Training: Being connected to your dog this way is a classic, proven and simple training technique to get a dog to follow you. Now when you walk in one direction, the dog must follow you. You have both your body and your intention behind the walk. It is a great technique that works wonderfully with both pups and older dogs too.